There may be a lot of plastic fantastic toys out there, but Candylab Toys has proven that they definitely do make ’em like they used to. 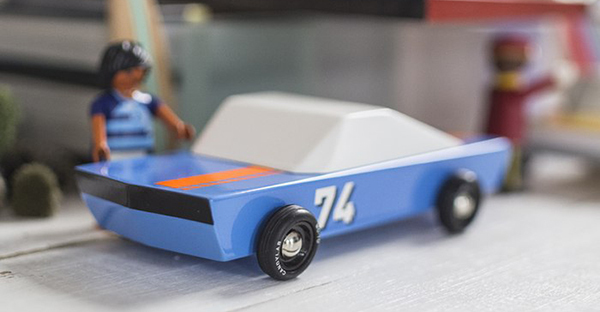 That’s right, Candylab Toys are back on Kickstarter with a new line of beautifully crafted wooden cars and the campaign has been a runaway success, with their funding goal reached in 48 hours. The people of the interwebs certainly know a good thing when they see it. With pared back retro designs, these cars are impossibly hip. 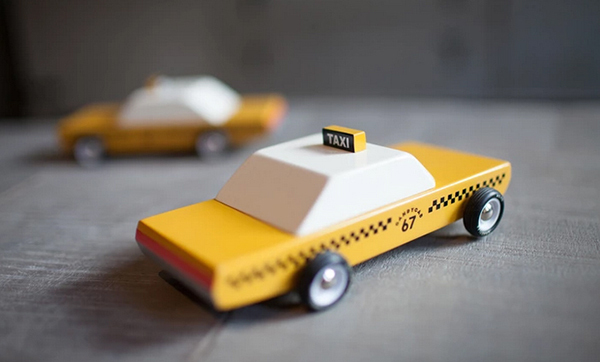 Each toy is tooled from a solid block of beech wood, hand-painted and assembled with custom designed wheels, pins and rubber tyres. The cars are the result of two years of design and prototyping and we think they’ve hit it absolutely spot on. 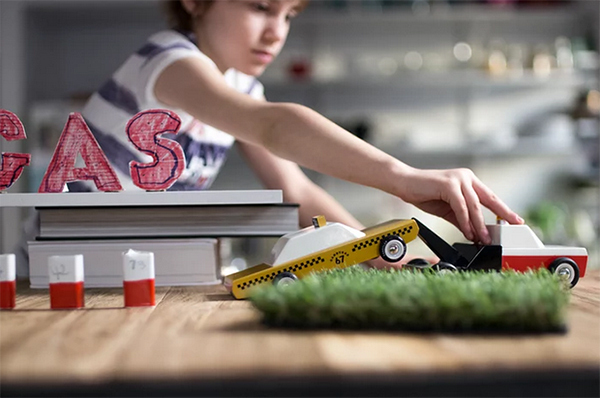 The cars are beautiful, each one a piece of art, and as a bonus for those kids who have an unfortunate tendency to break everything they touch, these cars are apparently totally indestructible. The line-up of new vehicles includes the Towie, a sleek red, white and black tow truck ready to roam the streets, hunting down illegally parked cars. There’s the Candycab, a late 60s slab yellow cab sedan, perfect for creating traffic jams on any imaginary street. Can you hear the horns honking? Our absolute, hands-down favourite though is the Woodie and its pal, Camper. The Woodie is pale yellow with real walnut veneer, a hidden magnet in the roof to attach the included surfboard. It’s also got a magnetic tow hitch to haul the retro, white and teal caravan to the best surf holiday ever. 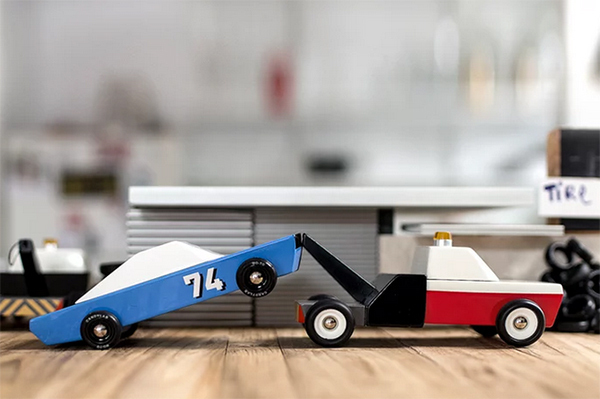 From the mouths of the folks at Candylabs themselves, “these two make for one of the most iconic automotive symbols of the American Golden Era. ‘Nuff said.”. 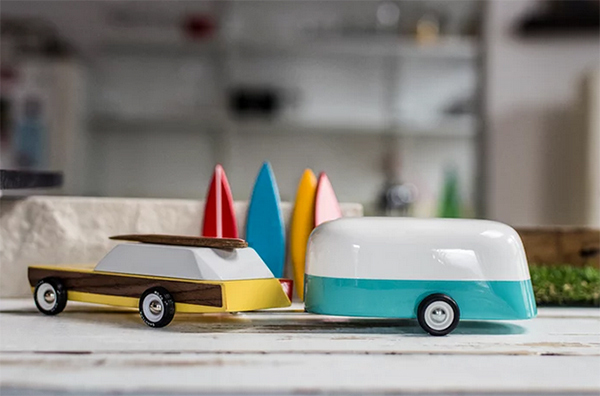 For US$39, you can get your very own Towie, or for US$59 get a pair of vehicles destined to be together: the Woodie and Camper with two surfboards included. Head over to Kickstarter to show your support.